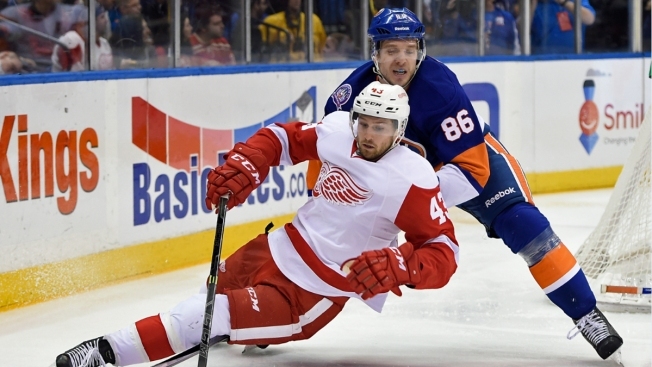 Red Wings center Darren Helm falls to ice after tripping on Islanders left wing Nikolay Kulemin's stick in the third period. Frans Nielsen's goal 16 seconds into the second period broke a 3-3 tie and the New York Islanders held on to beat the Detroit Red Wings 5-4 for their first home win this month. The Islanders came in winless in seven previous home games, last winning at Nassau Coliseum over Calgary on Feb. 27, and with only one victory in their last eight contests overall. New York quickly fell behind 2-0 before the teams went on to score six goals combined in the first 10 minutes of the opening period. Ryan Strome, Kyle Okposo, Brock Nelson and Cal Clutterbuck also scored for the Islanders. Tomas Tatar, Drew Miller, Niklas Kronwall and Pavel Datsyuk had Detroit's goals.